Precision concrete cutting service removing trip hazards from sidewalks. Comply with ADA. Polymer cement resurfacing system (6000+ PSI) for concrete, masonry, steel, foam, wood. Architectural load bearing surface. Sealed & non-porous. Resists freeze-thaw cycles & intense heat. Grout Restoration. Clean, repair, seal, change grout color, eliminate mildew, & small tile replacement. The Crack Team provides a year-round, in-demand foundation repair service with few competitors. Our brand has unmatched capability to promote the business and generate customers. Manufacturer of decorative concrete coatings since 1972. STARDEK is oil, grease and mildew resistant. We offer a 2 day and a 4 day free training class on surface prep, installation and marketing. We have all the tools to make your dream a success. Dealership opportunity in the decorative concrete field. Proven operations plan. Wide product line. 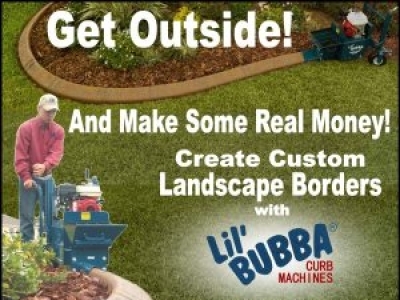 The Concrete Edge Company manufactures the Lil Bubba line of concrete curb machines designed to easily create curb style landscape borders. Decorative concrete resurfacing & seamless fluid flooring systems.